Exfoliate and smooth skin with Olive Stone‚ Horse Chestnut‚ Zinc PCA‚ L-Arginine‚ Aloe Vera and Grapeseed Oil! The Pioneer has hardened skin from the elements; Sea Salt weathered skin from ship travel and dehydrated skin from his expeditions. In truth every man’s skin suffers at the hands of the elements; the changes in climate combined with shaving and the general vicissitudes of life all leave their mark. Timely exfoliation of your skin reduces the occurrence of blocked pores‚ blackheads and ingrown hairs. 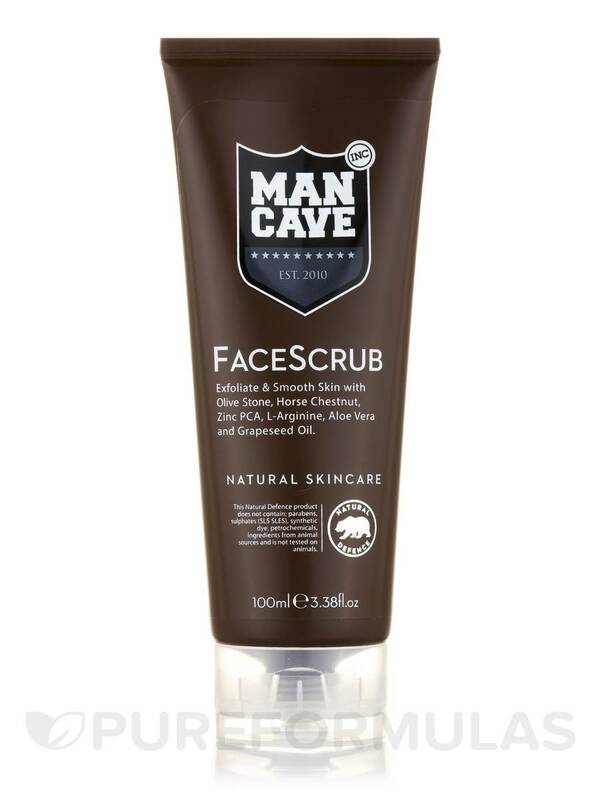 Put a new face forward – quite literally – with this natural ManCave FaceScrub‚ enriched with natural actives and 12 Essential Oils. Fine granules of Olive Stone create a textured‚ creamy abrasion to coerce the dead skin and debris from your face‚ improving cell turnover and unveiling the new skin beneath. This FaceScrub uses the skin-conditioning Vitamin-E to keep skin hydrated during the cleansing process‚ ensuring that as your old skin departs your new skin has a ‘gentle’ entrance to the world. L-Arginine and Aloe Vera help reinvigorate and energise your skin‚ hydrating new cells while having a smoothing effect. Aqua (water)‚ decyl glucoside‚ stearic acid‚ aloe barbadensis (aloe vera) leaf juice‚ cetearyl alcohol‚ cetyl alcohol‚ silica‚ glycerin‚ glyceryl stearate‚ olea europaea (olive) seed powder‚ vitis vinifera (grape) seed oil‚ aesculus hippocastanum (horse chestnut) extract‚ arginine‚ zinc PCA‚ tocopherol‚ phenoxyethanol‚ acrylates /C10-30 alkyl acrylate crosspolymer‚ parfum (fragrance)‚ benzoic acid‚ sodium hydroxide‚ dehydroacetic acid‚ potassium sorbate‚ citric acid‚ sodium benzoate‚ benzyl salicylate‚ coumarin‚ hexyl cinnamal‚ linalool. 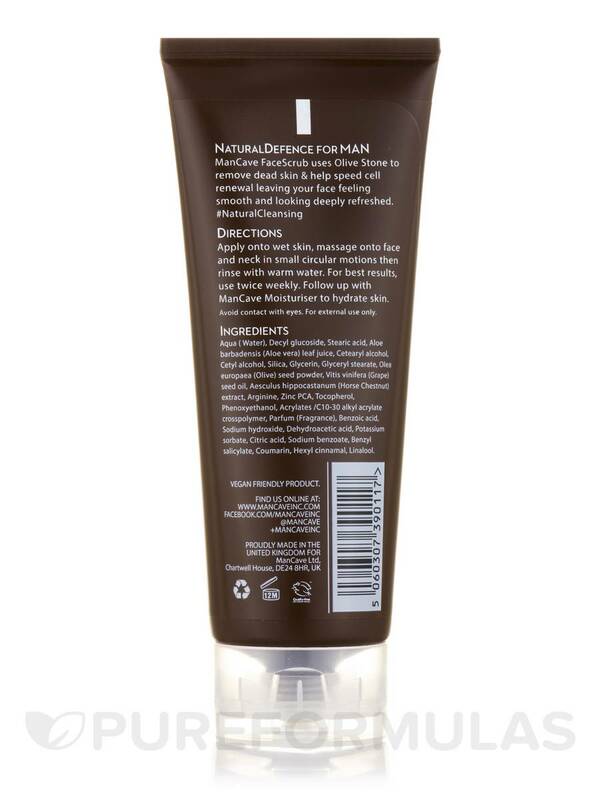 This Natural Defence product does not contain; parabens‚ sulphates (SLS SLES)‚ synthetic dye‚ petrochemicals‚ ingredients from animal sources and is not tested on animals. Apply onto wet skin‚ massage onto face and neck in small circular motions then rinse with warm water. For best results‚ use twice weekly. 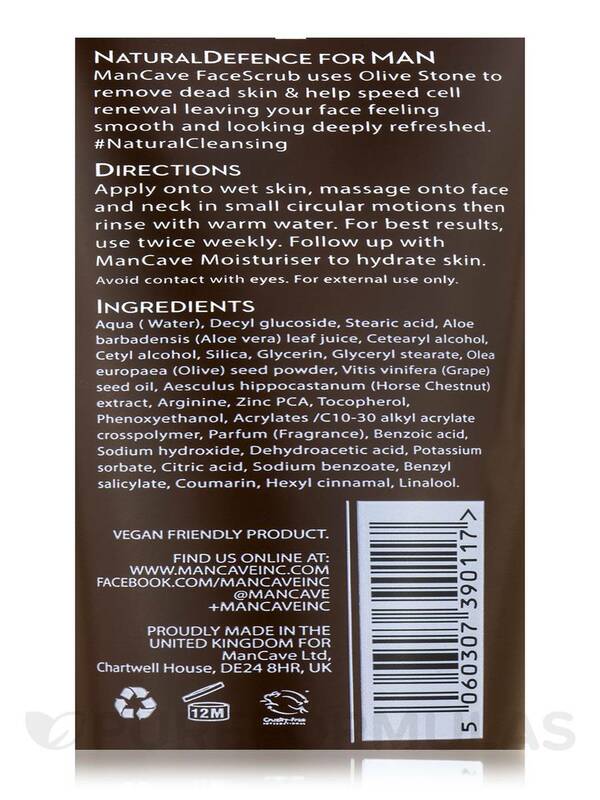 Follow up with ManCave Moisturiser to hydrate skin.